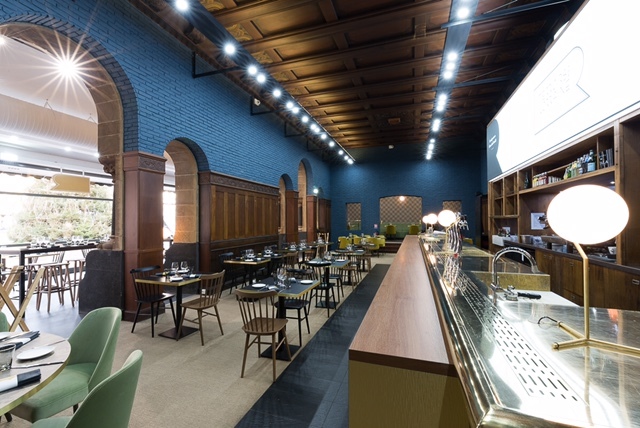 SSP France, a subsidiary of SSP Group PLC, a leading operator of food and beverage outlets in travel locations worldwide, has opened a new restaurant called ‘Terroirs de Lorraine’ in Gare de Metz station with renowned chef Michel Roth. The restaurant was created in partnership with SSP France and SNCF Stations & Connections. At the restaurant, guests can enjoy meals from a bistro lunch to a gourmet evening meal. The menu, created by Roth, will be served by chef Xavier Pauly and his team of eight. Highlights include perch fish and chips, Lorraine stew, classic mehlknepfle egg, and Rossini beef fillet. The restaurant has over 130 covers, with additional seating on a terrace which can be used in the summer. The décor, which features warm saffron golds and sumptuous cobalt blues, combines period features of the historic building with contemporary flair. The Gare de Metz, which has been a classified historic building since 1975, was granted the title of the most beautiful station in France in 2017. Born in Sarreguemines in 1959, Michel Roth began cooking at the age of 15 and has worked in some of the most iconic restaurants and hotels across France. In 1991, he was named Meilleur Ouvrier de France as well as winner of the Bocuse d’Or, and to this day is the only chef in the world to have received both of these prestigious accolades. The reputation of national star Michel Roth, will contribute to the renewal and restoration proposed in this unique station.